The Hotel de Rodes, on the corner of Rue de Spa and Rue de la Loi, which may have been leased by ministers before 1875, was taken on a ten-year lease by the Office of Works in 1875, and bought for about £14,000 in 1887. 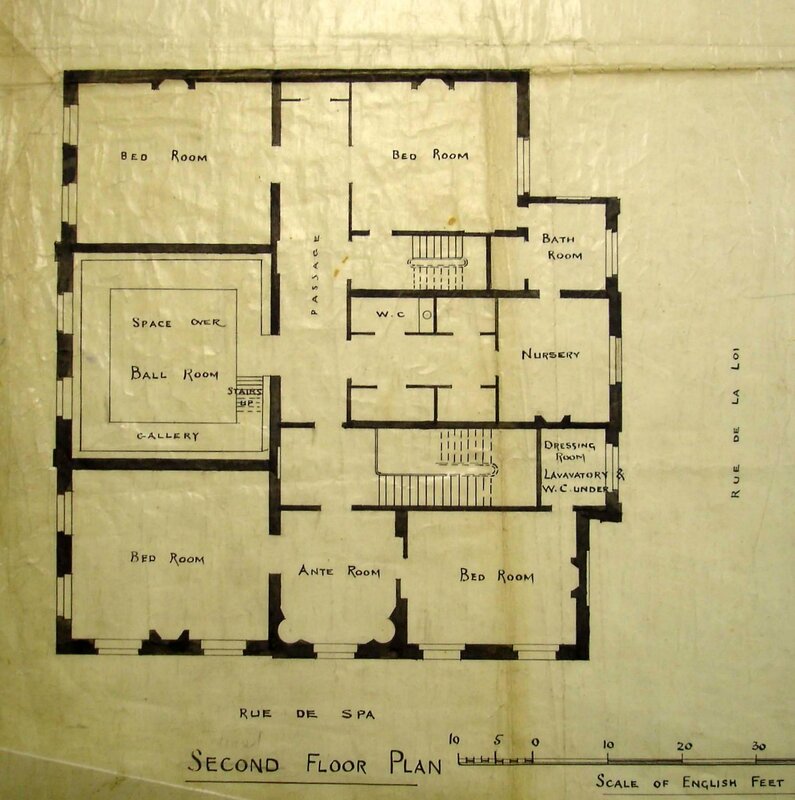 The courtyard was entered from Rue de Spa: on the left stood the three storey house, almost square in plan, and on the right a range of outbuildings used for stables, coaches and chancery. This building served as the mission house until the Second World War, when the embassy was evacuated. When the embassy was re-established in 1944, the Hotel de Rodes was no longer large enough for both residence and offices. The residence therefore moved into a fine house at 17 Rue Ducale, leased for two years from 1 May 1945 from Mme. Renée de Becker-Rémy (née Lambert), who resided in New York. During this lease, Mme de Becker decided to sell the house, resisting Ministry of Works pleas for a long lease. She asked for 25 million Belgian francs for the house stripped of panelling and tapestries or 35 million as it stood and with some of its furniture: all payable in US dollars. After the inevitable stand-off, she lost patience, put the tenancy on 3 months’ notice, and threatened to sell elsewhere. The Ministry of Works could find no acceptable alternative, and finally agreed in 1947 to buy the house and some of the fixtures and furniture for 23 million Belgian francs: paying in dollars had always been out of the question. 17 Rue Ducale was (and remains) a large and elegant terraced town house facing the Park Royale. (See Notes below.) It was built around 1830 but maintains the character of the Austrian phase of Belgian history. Mme de Becker carried out extensive reconstruction in 1923-29, with the help of Maison Jensen of Paris (whose decorator was M. Boudin), followed by considerable further alterations in 1934. These works included the building, on the site of the old stables along the north side of the garden, of a four-storey wing beside an enlarged and paved courtyard. The porte-cochere and conciergerie were greatly changed, the present dining-room and entrance hall taking their place: that there was then only one entrance, no garage and only a small garden were minor disadvantages. The interior is of outstanding quality and contains exceptionally fine 18th-century boiseries, textiles and furniture. 17 Rue Ducale continued as the residence of the bilateral ambassador until 1992 when he and Britain’s permanent representative to the European Community switched houses after some game-playing (entertainingly, and surprisingly accurately, described by Boris Johnson in the Sunday Telegraph of 12 July 1992). The bilateral residence therefore ended up at 21 Avenue Henri Pirenne, bought in 1963 for about £40,000, and 17 Rue Ducale today remains the permanent representative’s residence. The Hotel de Rodes was retained exclusively for office use after the residence moved out in 1945. But an explosion in staff numbers throughout the 1950s meant that by 1962, the year in which Britain applied to join the European Economic Community, the embassy’s offices in Brussels had spread into four other buildings as well: consular section into 44 rue Joseph II, visa section into 48 rue Joseph II, cultural section into 23 Avenue Baraix, and the EEC delegation into 68 rue Joseph II. This could not go on: even if the EEC application was unsuccessful (which it was) there would be a need for more space. The ambassador reported a promising development in May 1962: a well-known Belgian entrepreneur called Blaton, in conjunction with Costain of London, was considering a project for erecting a very large office building to be known as Britannia House, in the hope that British firms established in Brussels could be induced to take space there. The intended site was at the corner of Rue Joseph II and Rue Marie Therese. 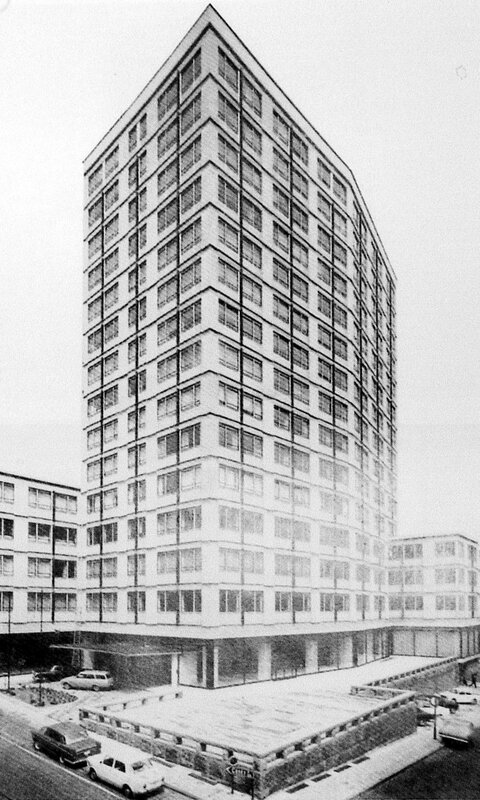 Costain, using architects Fitzroy Robinson and Partners, had approval for 12 or so floors and hoped to have the building ready for occupation in mid-1964. It took a while for the various interests to align themselves: the professional side of the Ministry of Works favoured the solution, the secretariat hankered for the redevelopment of the Rue de Spa site, and the head of the permanent delegation to the Common Market opposed the idea of sharing a building with the embassy. A senior meeting of all the parties at the end of October 1964 concluded that, although a Crown-built office building would be preferable to paying high rents (and would reflect the recommendations of the recent Plowden report), the best course in the circumstances would be to lease enough space for the whole embassy and permanent delegation staff in Britannia House. A proposal was put to the Treasury for a three-year lease, extensible to nine years, pending completion of a Crown build, for which no site other than the Hotel de Rodes was in prospect. The Treasury at first refused, pleading balance of payments problems, but relented after further pressure on condition that the Hotel de Rodes, expected to yield about £200,000 of foreign exchange, was sold immediately after it was vacated. A lease was therefore agreed for nine years from 1 August 1965 on the 11th -14th floors plus car parking and, slightly later, part of the first floor. The Hotel de Rodes was finally sold in 1966: it was later demolished. Britannia House proved a success. The lease was extended in 1974, again in 1983, and given up in 1992, once the sections of the missions had moved to more modern leased accommodation. UKREP moved to the 7-9th floors of 6 Rond-Point Schuman in 1975, the consulate and joint administration office to 1 Rue Marie Therese in 1976 (until 1991), and the whole bilateral embassy into newly-built leased premises at 85 Rue d’Arlon in 1991. UKREP moved from 6 Rond-Point Schuman to 10 Avenue d’Auderghem in 1996. Hussey,Christopher, ‘The British Embassy, Brussels’, Country Life, 11 September 1958. Block plan of Hotel de Rodes. 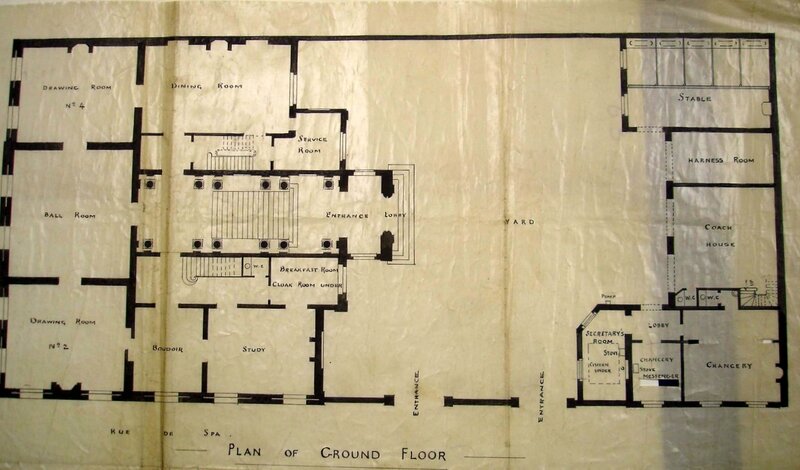 Ground floor plan of Hotel de Rodes, 1897. 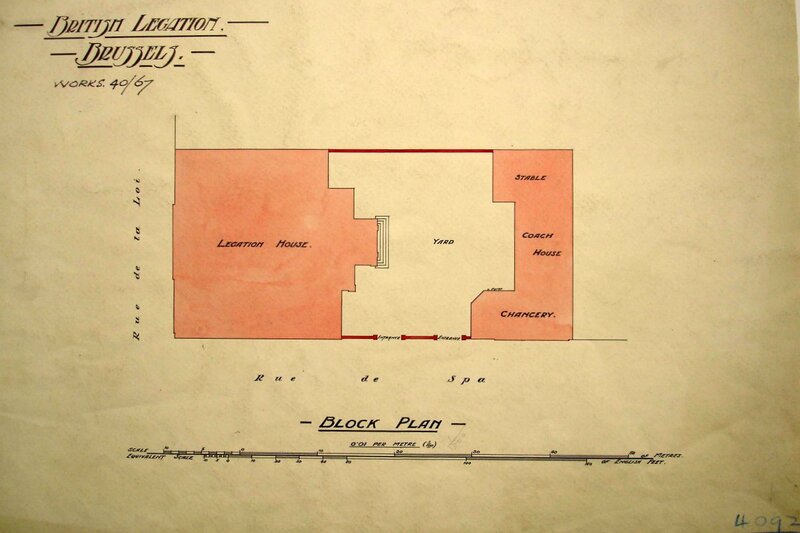 First (although titled here as second) floor plan of Hotel de Rodes, 1897.